View from inside car at intersection. Billboard was deemed a traffic hazard by LADOT, but is still operating. Billboards displaying a key City Council member’s name and face. “Endorsements” from non-profit organizations. A poll purporting to show that the public wants digital signs. It’s all part of a big PR blitz by Clear Channel, which which has been lobbying hard for an ordinance allowing digital billboards even though an appeals court ruled in December that the permits issued for the company’s 84 digital signs should be revoked. The billboards that prominently feature Councilmember Mitchell Englander are public service announcements for earthquake preparedness. One might expect that the spokesperson for such a campaign would be the mayor, not one of the 15 city councilmembers, even given the fact that Englander is chairman of the council’s Public Safety committee. One might also expect the billboards to be spread throughout the city to reach the widest possible audience, but they’re only found in the San Fernando Valley. Furthermore, a press release announcing the earthquake preparedness billboard campaign didn’t come from Englander’s office, but from SignUp LA, a coalition of billboard companies, businesses, and non-profit organizations put together by Clear Channel. Add all this to the fact that Englander is one of three members of the council’s Planning and Land Use and Management committee, which considers all billboard and signage legislation, and the fact that the San Fernando Valley has very few digital billboards and much less anti-digital billboard sentiment than areas like West L.A., where they are concentrated. Do that and Clear Channel’s strategy comes into clear focus. In fact, one of the cornerstones of the company’s campaign on behalf of its legally-beleagured billboards has been to argue their importance in broadcasting public safety messages. Others have been the argument that they stimulate local business and job creation, and are a critical way for non-profits to reach a much wider audience than would otherwise be possible. And a bunch have signed on–Minorities in Broadcasting Training Program, Aids Walk LA, Going Green Film Festival, Outfest, and Operation Hope, to name some. Whether or not these worthwhile organizations were aware of certain ironies posed by getting on Clear Channel’s digital billboard bandwagon isn’t known, so we’ll point them out. Clear Channel was severely criticized during last year’s presidential election campaign for posting anonymously-funded billboard ads widely seen as part of a voter suppression strategy pursued in minority areas of such swing states as Pennsylvania and Ohio. Clear Channel made news in 2010 for refusing to allow an image of two shirtless men on billboard ads for a Gay Pride march in St. Petersburg, Florida. Clear Channel’s digital billboards use much more energy than conventional billboards, but the company hasn’t followed the lead of sign companies like Lamar Advertising in testing solar panels to power them. What of Clear Channel’s claim that their digital billboards are an engine for business and job growth? In the absence of unbiased supporting evidence, one is left to actually watch a typical rotation of 6-7 ads on digital billboards, which is easy to do on the city’s west side, almost impossible in the aforementioned San Fernando Valley. If you do this, you will see that the rotations–eight seconds per ad–are heavily dominated by ads for movies and TV shows. And not just during awards season, but throughout the year. If one considers such multi-national media conglomerates as News Corp., Sony, Time-Warner, Viacom and Liberty Media to be “local” businesses, then movie and TV production may be looked at no differently than the car dealer or restaurant or plumbing contractor in your community, although ads for those kind of local businesses are few and far between on digital billboards. How many jobs are created by the presence of digital billboards? Again, no numbers from an unbiased source have been put forward, although one thing is certain. Conventional billboards require a crew to install the vinyl ad copy every time it is changed, while a digital billboard only requires someone with a computer at a remote location. So the 100 digital billboards now operating in the city–16 belong to CBS Outdoor–represent a loss of those installer jobs. 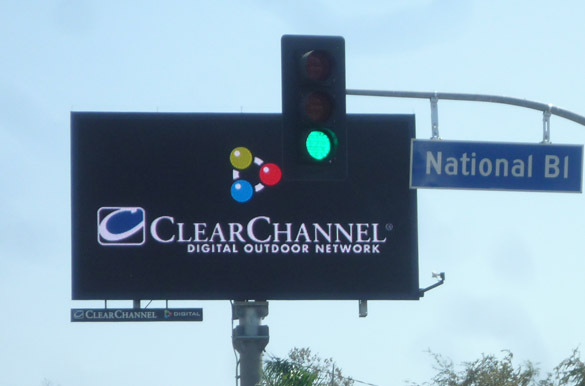 As for the poll commissioned by Clear Channel purporting to show that L.A. residents want digital billboards, more on that coming soon.